Today, we are going to ponder purses. But first, I have to let you know that in the south, they don't say "purse," they say "pocketbook." Even though I have been a southern gal since I was sixteen, I have not yet been able to make that particular southernism switch. Hence the non-southernized title of this post. First of all, let my introduce you to my purse. I bought it because it is bronzy/gold and goes with everything. 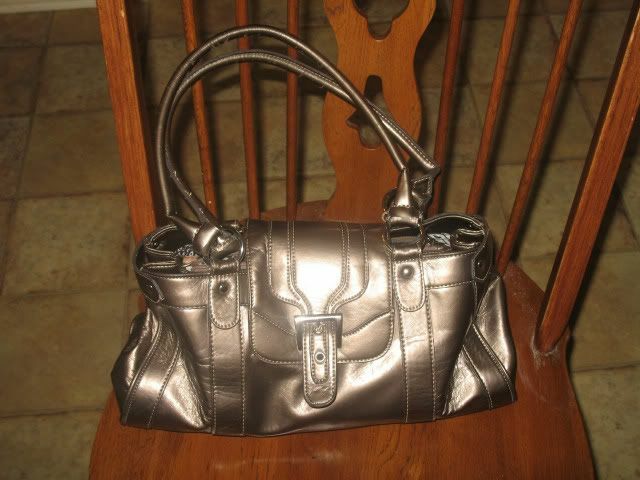 I quite dislike having to switch out purses with every outfit and so the bronze purse is a winner in my book. Okay. And this is where I make the declaration that my husband, as wonderful as he is, has no foggy idea why a woman needs to have a shopping purse. Every time I say to him, "Hold on a minute; I need to grab my shopping purse," he stops dead in his tracks and a look of puzzled befuddlement crosses his handsome visage. And every single time he asks, "Tell me again just WHY you need to have a shopping purse?" And I think to myself, "If you have to ask, I'm not even going to tell you!" However. Since you are my blogging buds, I am going to tell you. Just to see if you think the concept makes sense. Even though my husband doesn't. My regular purse contains within its voluminous depths half of the manufactured goods from the western part of the free world. I am one of those over-prepared women who has everything you could possibly need, want, or desire stashed somewhere in my purse. However. When I go into a store to shop and I know that I will be there for longer than fifteen minutes (not including grocery stores) I always switch over to my shopping purse which I keep in the van. The reason? I don't want to carry half of the manufactured items from the western part of the free world into the store with me. I want to carry three things. And yet, every time I get ready to head out of the car with my shopping purse, Steve steadfastly says, "Why do you need your shopping purse?" And in reply, I lovingly turn in his direction, smile sweetly and whop him upside with head with it. Well, at least he doesn't ask until the next time. How about you? Do you have an inscrutable habit or action that makes your spouse wonder about the remnants of your sanity? Also, please let me know that you think having a shopping purse is a perfectly fine and wonderful and brilliant and fabulous idea. Becky, I do the exact same thing! I have my "everyday" purse that holds so much stuff it's a wonder it hasn't exploded yet! And when I go shopping or to dinner, I always switch to a smaller bag or clutch. I really don't need to take my perfume, checkbook, makeup bag, today's mail, cell phone charger or kitchen sink to dinner with me, do I? I JUST started having 2 P/P! A wonderful "satchel" with a small P/P for the quick trips. In my little corner of the universe we use purse and pocketbook interchangeably! Sorry I haven't been around the past couple weeks -I ACTUALLY WENT ON A VACATION!!! The first in 10 YEARS - Yes, now I'm back (sigh). They are called purses up here in Washington state. I have an all purpose purse. It goes almost everyplace with me. I never switch it out to a smaller bag but I do sometimes carry a large Vera Bradley bag if I am going someplace where I want to include a water bottle. In that case I usually switch over just my wallet, chap stick and comb. Of course my iPhone goes everywhere with me. I have one large bag that my sister has taken to calling my diaper bag. It is quite large, with many pockets on the inside, because I like to be organized. I have the necessity items in smaller 'bags' on the inside, and can quickly deposit them in the car if I know I'll be somewhere for a long time and don't want the extra weight. I've never thought of a second purse, but may have to give it a try. We use purse and pocketbook interchangeably too. We use both terms up here in the Boston area. I hate them! I carry one only when absolutely necessary :) I have a black one that goes with everything-lol. I have never liked them or wanted one. Why must we have all this stuff at the 'ready'? Men don't :) I guess maybe I keep some of it in the car! Bec, great blog as usual. But I still don't get it. Love you anyway though. Okay, the logic is sound, but coming from a woman who carries her drivers license and debit card in her back pocket I don't really have a leg to stand on in this conversation! 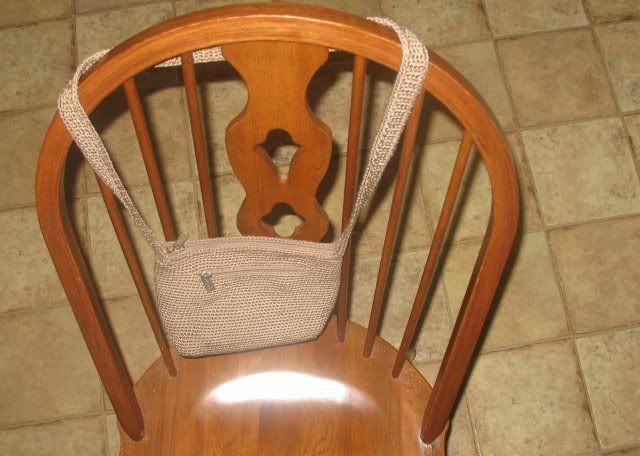 However, wouldn't it make more sense to have your shopping purse as a wallet with a strap inside your everyday purse? That way you have the essentials inside the everyday purse and you can just take it out when you want to travel light? fwiw, i have a backpack - for carrying my laptop and stuff to and from school. then i have.. a medium sized canvas bag that was my grandmother's that i use sometimes for carrying stuff / a purse; a knitted bag from iraq that i use for just carrying my wallet, phone, etc.. that my computer fits into as well if i need it too; a small backpack that i can take hiking but around town when i need it and a couple of other things as well.. i use things based on my mood. I have my going to work purse, my going to class purse, an assortment of going out purses, my shopping purse, and I have been known to match my purse to my outfit! When I visit New York City, nothing makes me happier than getting a knock off purse from the guy on the street corner for $15! I grew up in Virginia where the subject of your post is called a pocketbook. When I was almost 13, we moved even further south to Texas where this item is referred to as a purse. Imagine my confusion!! When I'm working, I carry what my husband affectionately refers to as "the suitcase." It's big, and it holds the OTHER half of the manufactured goods from the western part of the free world 'cuz ya never know when a girl might need something. But my back and my shoulders do NOT appreciate "the suitcase," so when I go shopping or out for the evening, I reach into the suitcase and pull out my "wallet on a string" as SuperSuz so aptly named it. It is big enough to carry my ID, debit card, phone, keys, lipstick and a tissue, but doesn't make my shoulders or neck rebel. I have a large purse, a small "wallet, phone, keys" purse, a briefcase, and a backpack, all in my car. Oh, and a fanny pack, because with my son, you never know when you'll end up taking a hike somewhere. There's also a first aid kit, a blanket, jumper cables, a bowsaw and hatchet (scouts.. be prepared), a case of water... oh, and a Bible. I feel pretty confident in facing most of what might come up while I'm on the road. So, yes, I "get" the shopping purse. The thing that most annoys hubby? The fact that I keep volunteering him to help out with stuff. Bless his heart. I share your pain-- I can't STAND switching purses. I have about four purses of various sizes, shapes, and colors, each containing a thick layer of detritus left over from the last time I used them. Of course, each time I switch I leave something important in the one I stopped using and end up missing it right when I'm out shopping and need it! I've taken to only using the very small purses so at least I can't shove every possible thing in the universe in there-- otherwise my purse would be as full and heavy as yours undoubtedly is! While I do not have a shopping purse (although I may now because that is a great idea), I do have a "make-up shirt" which befuddles my husband. I always take it with me when we travel and it rarely gets washed. I will explain. My make-up shirt is an oversized t-shirt with a perfectly stretched neck that I put on over my clothes when I am putting on make-up. I usually get dressed and then put on my make-up. Inevitably, I get foundation or some other manner of make-up on my clothes that causes me to have to work feverishly to get it out or just change clothes entirely. My make-up shirt catches these indiscretions and saves me immeasurable time cleaning or changing. I had my "shirt" with me when we went to a wedding and accidentally got toothpaste on it. All I could think was that that $10 shirt I bought for a fundraiser saved my dress(the only one I had for the wedding) that day. My husband does not get it. But, I should not expect him to, poor guy, he does not get to wear make-up. Pam D - I've got it all but the saw and the case of water! I'll get right on that! Steve . . . it's okay. Try reading Bill Engman's (sp?) book titled, "I'm Just A Guy." You won't feel so alone. The "Make-up Shirt" - pure brilliance. Will go through my closet this weekend. I do have the "Hair Dye" shirt - does that count? Can't wait to share these with other friends! While I don't have a shopping vs. everyday purse, I do have a "vacation" purse. Oddly enough my vacation purse is smaller that my everyday purse- you would think I would need to stick ,ore in it if I was on vacation. Well, no, I don't have a "shopping purse" but when I don't need all that junk er handy miscellaneous items that we all use on a maybe monthly, semi anual basis, I grab my little backpack. No it isn't a large backpack it is a mini-me backpack which I put my wallet my phone, maybe carmex and definately a twenty ounce bottle of soda or water. But I don't know what I call it, hmmm. I know someone e-mail me and tell me what to call my trusty little mini backpack.